​We provide a healthy snack for the children aged 2 and over every day. Each child has their own 'snack mat' which we make with them during their first week with us. It includes their name and some photographs of foods that they choose to stick on, along with their special symbol which the child chooses for their tray and their coat hook too. Details of allergies can also be included on the snack mat. This is then laminated. Children learn very quickly to recognise their own snack mat. 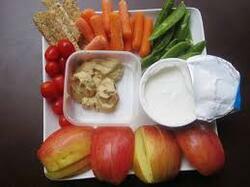 Children under 2 bring their own healthy snack with them. We have a "rolling snack" system where children choose when to come for snack during the snack time. Children develop confidence when they can make their own choices, and a rolling snack bar means that they do not have to interrupt their play and learning. In addition to our healthy snacks, we encourage healthy lunches at playschool. 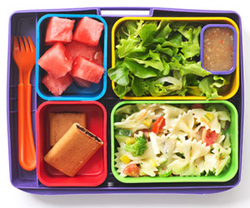 Lunches are kept in the cool kitchen annex, but we would recommend an ice block in lunch boxes to keep contents fresh. Milk or water are also on offer at lunch time. Children can have a drink at any time during the playschool day. Staff sit with the children to eat their own healthy lunches at lunch time. 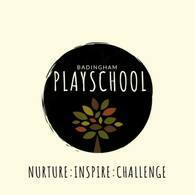 We offer special cooked lunch days at playschool on dates that can be found on our newsletter and on the blog. This is a healthy cooked meal, followed by a little dessert. This meal is optional and costs £2.50 per child. This is a good opportunity for the children to experience a cooked lunch in a school atmosphere, particularly if school dinners are planned in the future. It is also a nice social event. Please see the blog for the next cooked lunch day. We hold regular "key person" lunches where parents and carers are invited to come into playschool, sit with their child and their key person, and share lunch together. 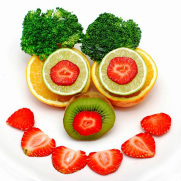 We taste all kinds of healthy foods and share ideas for lunch boxes and easy cook, child friendly recipes. Please see the notice board for the next key persons lunch event.